Package shape has for centuries been one way breweries distinguish their products and send signals to consumers about what they'll find inside. * Back in the late 1970s and early 1980s, little breweries sold beer exclusively in bottles. Everything about "microbrewering" in that era was bound up in a self-described ethos of quality, and bottles were a visual rebuttal to the disposable, "cheap" beer they were seeking to replace. At the time, critics of mass market lagers claimed they were made with chemical additives and cheap ingredients, and the cans they were mainly packaged in seemed to represent--to a segment of the population, anyway--the "tinny," flavorless beer inside. More "natural" glass bottles signaled microbrewing's commitment to higher quality, natural ingredients and production methods. In the 1990s, the pack mentality that originally helped create a thriving segment became competitive, and breweries started looking for ways to distinguish themselves. Many traded in their heritage bottles for longneck and proprietary bottles--though this was largely a cosmetic change. Toward the end of the 90s, however, breweries began making rare, specialty beers. In order to signal their special status (and, possibly, justify their expense), breweries started using wax-dipped and cork-and-cage bottles. A single brewery might use three or four different bottles to signal different things to different audiences. Cans finally made their debut as a craft container in the mid-aughts, but they were tolerated rather than celebrated. No one took them as a signal for "quality," though eventually customers began to accept that they weren't the reverse--a sign of cut-rate, cheap beer. Even a generation after the first microbreweries appeared, cans still had to fight the image of cheapness. It has been a long transition. Despite a series of reasons why cans are at least as good or better than glass (for the beer and the environment), few breweries switched. Over the course of a decade, drinkers got accustomed to them and more and more breweries did tentatively start moving aluminum-ward. The most-coveted beers from the most-coveted region of the country right now mostly come packaged in cans (that's Hill Farmstead, an old-timey outlier on the right). New England is ahead of the pack on this, but they're not an outlier. If you want a Sticky Hands or Three-Way IPA here in Oregon, look for the sleek cylinders. My mind has been trained to take not of the stripped-down elegance of Modern Times. Pizza Port? 805? Cans. Oh, and don't forget those newish, saturated-color, pop-off four-pack rings; they're part of the image, too. In relatively short order cans have gone from a package customers will grudgingly accept to something entirely unexpected. Now, for certain breweries and certain types of beer, they signal freshness and trendiness. It is in some ways a repeat of the Sierra Nevada example: once respected breweries making popular beer started using cans, others got in on the action. 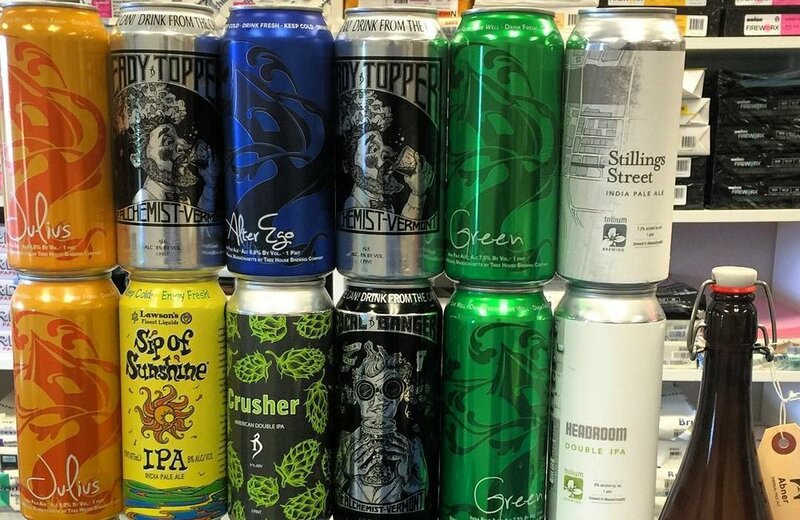 Cans have been one way for smaller breweries to enter the market, but because breweries have to buy vast quantities of empty cans ahead of time--which requires substantial warehouse space--they release select brands in cans. For breweries with very popular beers, mobile canning an easy way to expand sales without large capital outlay--even if you only plan to sell them from the taproom. And this confluence of events has meant that consumers are now spending substantial sums on four-packs of beer rated as the best in the country. Once Alchemist, Tree House, and Trillium started selling their IPAs in cans, other New England breweries wanted to signal that they, too, had the juice. Which brings us full circle. In the early 1980s, cans were considered low-brow symbols of mass market culture. They were the physical manifestation of cheapness and everything microbrewers rejected. Now, thirty-odd years later, they have been reinvented as the coolest-latest, containers signaling the trendiest, must cutting-edge beers. At least in places like New England, bottles now signal beers that are older and more stodgy--something your father drank (which is why nearly every week I get a press release announcing a brewery is switching to cans). You want to let people know your beer is the good stuff all the cool people want, put it in 16-ounce cans with high-contrast, pop-off rings. They'll get the signal. This too shall pass. But for the moment, cans are cool again. *Way back in the dark ages, Patrick described signaling theory using Rogue's pricing strategy. Go give it a look if you need a refresher.